Occupiers Sing "[email protected]$K The USA", Civic Duty Or Destructive Force? Katty Kay thinks these people are nice, filled with a sense of civic duty and lawfulness. Her colleagues want you to believe this is all about lax banking regulations and corporate welfare. Last time I checked, that didn’t cause people to say “F#@k” an entire country. At BBC News Online, they see such a strong parallel between this and the Tea Party movement (is it because they’re mostly hideously white? -ed), that they’ve spent time picking cherries in order to put together a quiz, asking you to guess whether some quasi-political statement was made by a Tea Partier or an Occupier. It would much more informative to put together a set of photos and police blotter reports, and then ask which is which. Of course, that wouldn’t help the BBC’s Narrative. Although I must say I enjoy the Beeboids’ intellectual hypocrisy of suddenly using the Tea Party which they disparaged as a positive example now. Note to the BBC: Nazis and Communists support the Occupiers. Any chance you’ll report that? At the bottom of the latest watered down report of violence and arrests and lawless behavior by the Occupiers, the intrepid BBC News Online team does what they always do for protests they support: Ask readers if they’re involved and to send in their comments. To my knowledge, there has never been one of these for the Tea Party movement. If a defender of the indefensible or BBC employee who has been notified of this “hate site” could point one out to me, I’d be most grateful. Staff at Citibank near Washington Square Park called police because “very disruptive” protesters “refused to leave after being repeatedly asked,” the bank said. They shouldn’t have been there in the first place, yet the BBC refuses to point out that this is illegal behavior. No, they love this stuff, support it 100%. Speaking of people who support the Occupiers 100%, if anyone reads Inspector Gadget’s blog, they’ll know that he does, and claims that most police do as well. They’re arresting people now because they have to, but if the Government doesn’t do something to get the police back on side, they won’t do it forever. Or, if the idiot Occupiers ever figure this out and stop calling them fascist tools and do something to get the police on side, it will be a different story. I’ve said it before and I’ll say it again: this is a recipe for disaster. When the police are on the side of the destroyers, they will eventually stop doing their jobs. The more the BBC demonizes the police, the less inclined they’ll be to act on behalf of a Government they detest. But I digress. The New York protests began on 17 September with a small group of activists and have swelled to include several thousand people at times, from many walks of life. Anyone ever seen a BBC report describe a Tea Party protest so generously? Funny how they’re now so careful to be generous to these people, the exact opposite of the way they’ve handled the Tea Party movement. No sneering or insulting with sexual innuendo, no suggesting ulterior motives or unseen hands pulling their strings. No hand-wringing over the “anger” this time, eh, BBC? So I ask the BBC again: Why don’t you discuss the fact that the Tea Party movement actually went out and did what decent, civic-minded, law-abiding citizens should do and took their anger out at the polls, rather than vandalize and occupy private property, and disrupt? Why don’t you point out the irony of the Occupiers are able to do all of this only because other people are giving them money to do it? And that they believe they’re entitled to other people’s money to do it? That’s not the American ideal of working hard and having it pay off you claim they want. Why not discuss how convenient it is for these protests to fill news broadcasts so nobody is talking about the President’s looming scandals: Solyndra, where the White House is still refusing to turn over relevant documents and communication, and Gunwalker, in which Attorney General Eric Holder and FBI Director Robert Mueller have been subpoenaed. And most importantly: Why don’t you ask the Occupiers why they haven’t protested outside the White House? After all, the President is the greatest recipient of Goldman Sachs largesse, and He’s the one who authorized more bank bailouts, and is handing over billions of taxpayer money to greedy corporate cronies. Oh, that’s right: you’ve censored all that news, so can’t start talking about it now. This is an intellectual failure of the BBC. I think I’ll go down to visit the Occupiers next weekend to see what else the BBC isn’t telling you. 17 Responses to Occupiers Sing "[email protected]$K The USA", Civic Duty Or Destructive Force? The BBC is stuffed to the gunnels with agitprop “strike a pose” lefties, who love to see other peoples places burning down…the smell of adrenaline and fear and the sniff of serge and sweat. Yet don`t you interrupt their Pimms soirees or question their expenses. I`ll keep saying it David…it really is about time you mucked the barn out of our refugee toadies and naysayers. If they don`t love your country-and thew BBC hates the very idea of the United States unless Howard Zinn OK`ed it…send them back to us. There will be a lot more that 2000 of the useless ticks to sack at the Beeb before too long. God Love the USA-as much as God hates the BBC! Good man, David. Hope you’re going to take your camera again! BBC News is giving a heck of a lot of coverage to these people and basically just giving them a platform when they put a mike in front of their faces. The BBC are portraying them, and going out of their way to do so, as “middle class people” who are not communists or socialists, just people concerned about their future. Amazing two people singled out by BBC News24 to be given a platform to speak were both working and expressed profoundly left wing view. For some reason, these basic questions are not occurring to the BBC. I think the problem is that it is these demonstrators who just represent 1% of anti-capitalist extremist, and the BBC is among that 1%. 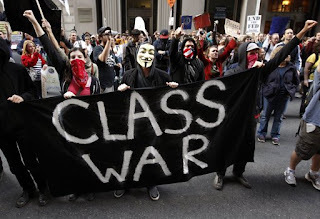 ITN has rightly been calling them “anti-capitalist demonstrators”. Non of this patent propaganda guff that the BBC are keen to have us swallow that they’re just ordinary middle class people with no political allegiances. At 17:05 today I tuned to BBC News24 to be met with a live Luther King Memorial Day speach from Obama. Not wishing to listen to more, “hope and change” rhetoric I immediately retuned a couple of stations up the dial and found Russia Today. Over the next ten minutes there was a lengthy report covering about twenty cities with occupations protesting against the bankers and their puppet politicians. This was followed by an interview of Nigel Farage about the Eu bailouts (how often is Nigel interviewed on BBC News compared to the number of times he’s ritually abused on Question Time?). I then popped back over to BBC. About ten minutes had elapsed sinced I’d tuned away from them, and there was Obama still pointlessly generating hot air. I think I’ll be watching more RT in the future. It may be as biased as the BBC, (in a different direction), but it’s a lot more interesting. I too find R.T and even Al Jazeera to be more honest than the slimy BBC. At least their bias is as obvious as you`d expect…and when they are not banging their specialised drums of traditional prejudice, then they are pretty good. They telegraph their bias, so you can take the rest to be accurate. The BBC,on the other hand< will not put a story out until it has been pre-chewed to their culturally correct nostrums. In essence, RT and Al Jazeera have labelled their antifreeze bottles…bu the BBC stick it into the wine and pretend that they don`t! If I was one of the hangnails loitering before the Beebs cameras I`d be careful. Being a fellow weekend rebel, they might listen to HIM at least! 1 – Tea partiers obey the law. They don’t go where they are prohibited and they respect the property of others. 2 – Tea partiers go home when they are done. 3 – The Anti-Everything crowd are rude, bad mannered, and have lists of people (note – people, not ideas) they hate. Such people are acceptable targets for abuse and harrassment. 4 – When asked what they want – TPs have a coherent set of demands. They want less government, less taxes, less unnecessary laws and respect for the Constitution. 5 – When asked what they want – AEs look confused, but may say they want bankers, CEOs and Conservatives taxed to death, locked up, exiled to … (uh, Peru, or somesuch). I am sure you can all think of more, but you get the picture. The Tea Party believe in action by the ballot box, the left wing scum the BBC likes believe in violence. Fat polly was just on Sky News bleating away, her numerous chins flapping away. She’s moaning about capitalism, moaning about the Tax Payers Alliance and moaning about anyone who doesn’t agree with her. Funny thing is, when McQueen of Fife was in charge and all this banking failure was kicking off, I don’t remember fat Polly going after Brown and co at the time. Nor has she complained about the Guardian’s tax-dodging, nor grapsed that her own wealth makes her part of the supposed 1%. Do as I say, not as I do. I’ve just seen that these awful things are planning to occupy the Stock Exchange from 7:00 a.m. tomorrow? Why so early, do they want to get it over with before starting work? If they stayed for half an hour, it should allow them plenty of time to get to their BBC offices. It would be wonderful if these promised arctic blizzards come early and start first thing in the morning. Let’s see if either former Guardian journalist Daniel Nasaw or former Obama activist Matt Danzico agree it would make a good story. Internet sensation, posh kid, political angle – perfect, except for the fact it makes the Occupy movement look silly. If only he was a Tea Party activist. Thanks as usual for an honest update on OWS. How many people there ? – a few hundred ? 2000 tops ? Over here the same rentamob have set up camp in the precints of St Paul’s Cathedral – our “state ceremonial” church. And some dumb Canon there has said he supports them – they can stay. David – if you look at any pictures of London hundreds of years ago – always there is St Paul’s high on its hill. Many times rebuilt. After the Great Fire of London in 1666, the new St Paul’s was designed by Sir Christopher Wren. A magnificent building, a symbol of the grandeur of London. Nelson is buried there, and Wellington. Churchill’s state funeral service was there. A few days after 9/11 there was a memorial service at St Paul’s. David, you know the footage – but here is some of it again. And now we have these punks “occupying” the churchyard of St Paul’s. How dare they insult the majority of Brits ? How dare these bloody anarchists claim to speak for anyone ? I am not a supporter of the English Defebce League, let alone the BNP. But who else could organise the necessary numbers to go to St Paul’s and clear the trash off the grounds of our national church ? …and that’s an absolutely criminal use of a Fender Strat – bloody racket. But – it’s probably worth a grand or so – how did such an oppressed and destitute unfortunate afford such a costly luxury?